A fond look at the vinyl version of a ’70s holiday TV staple–though sadly little seen today—with characters revived in the ’80s with a second special and a line of merchandise. Released in 1983. A DimenMark Music Production. Executive Producer: Thomas A. Mayfield, Producer, Arranger, Orchestrator, Conductor: Larry Mayfield. Writers: Larry & Diane Mayfield, John Barrett. Drama Director: John Barrett. Engineers: John Bolt, Bob Clark, Ed Yelin. Remix: Toby Foster. Mastering: Steve Hall. Running Time: 25 minutes. Voices: Tommy Smothers (Ted E. Bear); June Foray (Patti Bear); Louie Nye (Professor Werner Von Bear); Sue Raney (Narrator). Songs: “Where Can I Find Christmas?” “Merry Christmas” by Doug Goodwin; “Ted E. Bear,” “The Happiest Time of the Year,” “Santa Song,” “My Christmas Tree,” “I’ll Take Christmas With Me” by Larry Mayfield. 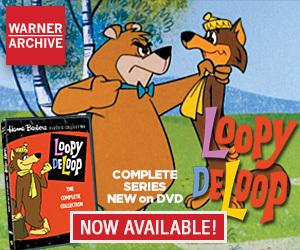 DePatie-Freleng produced quite a handful of primetime specials–getting the most acclaim for the Dr. Seuss ones–but there was one special that enjoyed a good run on broadcast, cable and early video releases. 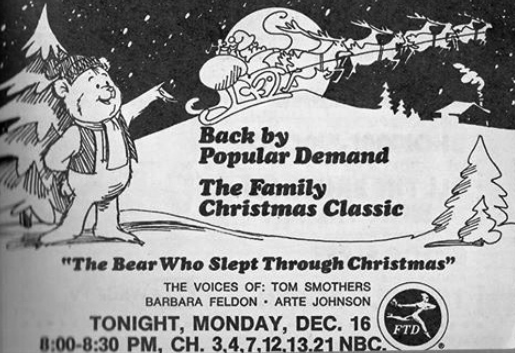 1973’s The Bear Who Slept Through Christmas, originally sponsored by FTD Florists on NBC, was a perfect fit for the charming, unpretentious DFE style. 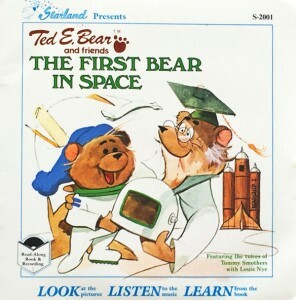 A decade later, Ted E. Bear and the characters from the special reappeared in a new line of merchandise including books, plush and recordings, along with a new special called “The Great Bear Scare”, produced by Rick Reinert Productions—which also had a hand in the merchandise art (Reinert’s company also supplied animation for Disney, including “Winnie the Pooh and A Day for Eeyore”). Writer John Barrett, who is credited on the special (with as well as DePatie-Freleng’s Return to the Planet of the Apes series), was clearly the connection between the characters’ 1973 genesis and their return ten years later. To animation recording fans, the best result of Ted’s rebirth was this 1983 album. Though not a soundtrack, it is a fully-orchestrated collection of pleasant songs with short story continuity between them. The lush, string-laden sound of the album was a delightful surprise in an era in which synth music was the dominant sound for animation and kids’ records—and even on this album, there is an electronic drum kit making that “Piow! Piow!” sound some may remember from the early days of Entertainment Tonight. In addition to original songs by Larry Mayfield, the album includes the two songs from the DePatie-Freleng film: “Merry Christmas” (heard as Ted explored the city during the holiday season) and the ballad, “Where Can I Find Christmas?”, which was the overall theme. This song was also recorded by Johnny Mathis. All the other songs are original compositions by the album producer/arranger, Larry Mayfield. The The Bear Who Slept Through Christmas TV special is available through amazon, iTunes and other streaming services, but has never had a proper DVD release, nor has this album ever seen reissue. 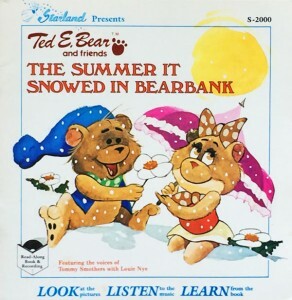 It’s too bad, because Ted E. Bear and his fellow residents of Bearbank are very appealing and still could be a viable franchise. This Doug Goodwin song demonstrates the formatting of the record album. It is not a story, but a set of songs with occasional narration and dialogue bridging the music. Released in 1983. A DimenMark Music Production. Producer/Director: John Barrett. Editing, Mixing, Engineering: Ed Yelin. 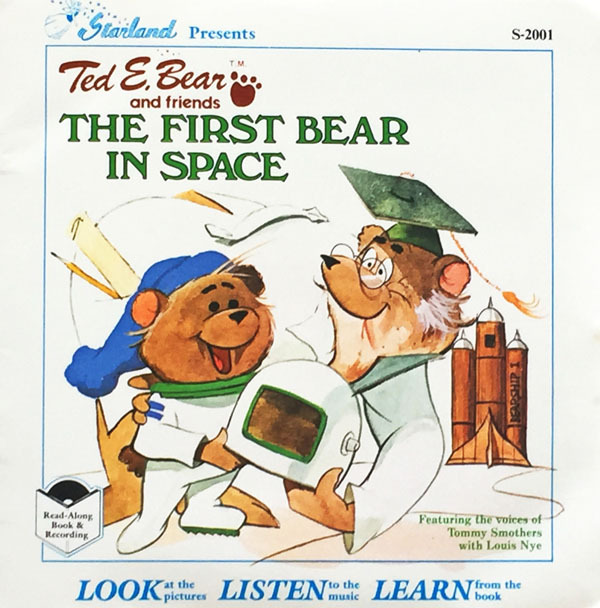 “Ted E. Bear” Song by Larry Mayfield. Voices: Tommy Smothers (Ted E. Bear); June Foray (Patti Bear); Louie Nye (Professor Werner Von Bear, Store Bear, Bum Bear); Sue Raney (Narrator). I notice a change on Patti Bear, the original ( from The Bear Who Slept Through Christmas) had a unique hairstyle popular in the 1970’s while the 1980’s version had a ginormous bow on her head that looked like something out of Minnie’s Bow-tique! I remember watching it back in the 1970’s in its entire uncut version and in later years several scenes were cut to make room for more commercials. I recall USA Network during it’s final years of running holiday specials in the 90’s did quite a hackjob to specials like this one. The change in designs between the 1970’s version and what followed in the 80’s is pretty night and day given the direction they would go with in making Patti Bear practically a “Ms. Male” character (for anyone who’s seen those “Feminist Frequency” vids). Greg – What a great topic today! This is one of our home’s favorite specials. We annually watch the DVD-R we made from the VHS release many years ago, although, as you mentioned… this special is easily found on several streaming platforms today. On our VHS version, after the original Christmas special ends, it cuts to an odd live-action newscast with Patti Bear at the anchor desk (someone in a mascot-style costume). I’m guessing this segment is somehow part of the characters’ 80s revival? That was probably from another video that came out in the 80’s called “Ted E. Bear: Cub Reporter”. Someone once posted the whole thing up on YouTube once but it’s gone now. Perhaps your VHS copy simpy showed a preview of that other tape, since FHE carried all three specials. 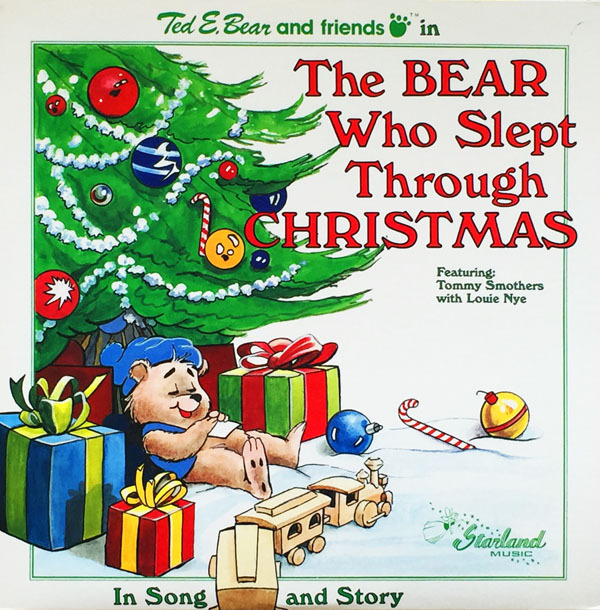 I recall the LP to “The Bear Who Slept Though Christmas” being advertised on TV a lot in the mid 80’s since that seemed to be the go-to avenue for “Starland Music” otherwise (mail order). Back then it semeed like interesting in “Ted E. Bear” was pretty big than where it probably was in the 70’s after that first special. No doubt getting a second animated special helped it out. I recally can’t associate Rick Reinert with that special to tell you the truth. The special itself is another can of worms that needs not to be discussed, but Mark Kausler had a good story about it’s rather splipshod production. It’s almost as if the keys/layouts were rendered without any inbetweens besides lip movements, and scenes are given these dissovlves whenever a change in a pose happened. I suppose it gave it a more storybook approach (as we were starting to see that happen with home videos sold by companies like Golden Books) but it just comes off too tacky and odd for a holiday special. I guess they didn’t think of farming this off to Asia quick enough. It always seemed odd from a certain standpoint that they did that. I suppose the first special was rather finite in it’s closure of Ted leaving Bearbank forever and never saw Patti again. The 80’s material could be seem as a reboot with Patti now having gone from a secretarial position for C. Emory Bear (who I think was the mayor of Bearbank in The Great Bear Scare) and simply becomes a reporter for the TV station (replacing a bear who was practically the “token black” reporter/anchor previously). At least she’s not into horoscopes anymore! The only other Ted E. Bear thing I know of is a very cheap live-action muppet-like video where Ted E. Bear appears as a reporter on Patti’s Bearwitness News team. Going on Amazon, FHE released this tape in ’88, and perhaps during the last vestage of the franchise as a whole. It appears Lionsgate has all three specials in their mitts (not sure about the records or books, assuming they have control over the IP). Used to be up on Hulu a few years back for free, but I guess Lionsgate still needs some cash, but it’s out there. but has never had a proper DVD release, nor has this album ever seen reissue. It’s too bad, because Ted E. Bear and his fellow residents of Bearbank are very appealing and still could be a viable franchise. You would think. Assuming what it takes to ressurect a 40+ year old property at this point. If a new special was in the works, would it be rendered in flash/vectors or 3D? The world may never know! Where could I find that, Chris? Haven’t heard from you since the old GAC Forums Dave! Nice you responded. All I know is what he said in this interview he did for The Animation Guild for their blog. He mentioned he worked with Mary Roscoe who was Chuck Jones’s assistant/producer/production manager during the 70’s on a number of projects such as the Kipling trilogy, the Raggedy Ann & Andy holiday cartoons or the ones for WB. Mark did say it was a rumor he had heard otherwise but he mentioned this after bringing up how he got fired off of one of Chuck’s cartoons for creative differences. Thanks for the info on the Kausler interview, Chris — I’ll have to go listen to it again. We put a lot of time into this show at Reinert – did lots of design work and character layouts – but the production was yanked away from us when the guy we were doing it for was indicted for fraud! I never knew that it had been completed by others and apparently aired! I really can’t remember how it all shook out, so I was hoping Kausler’s comments could refresh my memory! I do recall that among the people animating on it (while it was still under our purview) were Dan Haskett, Glen Keane, Mark Henn, Fred Hellmich and Mark Dindal! None of their scenes seem to have survived the transfer to a new producer. I get the impression whoever did ended up with this simply couldn’t pay a different set of animators the same amount that you guys were doing it for, so we ended up with what I call a prototype to something like Katie & Orbie. It also seems to have the distinction of missing it’s original Halloween deadline and ended up being ran on Christmas instead. Noticed a copy is still up on YouTube, subtitled in another language but it’s all there, for anyone who wants to be reminded where all that money went! Before I read this blog post yesterday, I had always assumed that “The Great Bear Scare” was made by Nelvana, since they used that same “no inbetweening” type of animation in “A Cosmic Christmas”. I wouldn’t have noticed that at all, really. Nelvana’s used it as a distancing device to show the difference between the three alien figures from the rest of the earthling cast. For Ted. E Bear, it just seems like blatant “GET IT DONE NOW!” method. I was in a thrift store in Toronto a couple days ago and saw a video of Ted E. Bear for sale in a Christmas display they had put together. I immediately recognized the artwork of Rick Reinert on the cover, for I worked for him in Cleveland in the mid-70’s, but also was confused about a DePatie-Freleng connection that I recalled. I am reminded by your article of both, and it all makes sense now. I can see how the Rick Reinert redesigns could confuse some due to their use in branding the IP.